So Summer of Arcade draws to a close, then, and it’s hardly been a vintage year. Microsoft shot their load early with Trials Evolution, Minecraft and FEZ, all of them now distant memories as gamers try to make excuses for a terrible port of a 15-year-old skateboarding game and a zombie-infested 2D platformer that needed another year in development. Wreckateer and Hybrid certainly raise the bar somewhat (by which we mean they pick the bar up off the floor) but where’s our Braid? Where’s our LIMBO? Where’s our Shadow Complex? Where’s the game that people are going to look back on in years to come to say that Summer of Arcade 2012 was all about that game? Well, in short: it’s here. 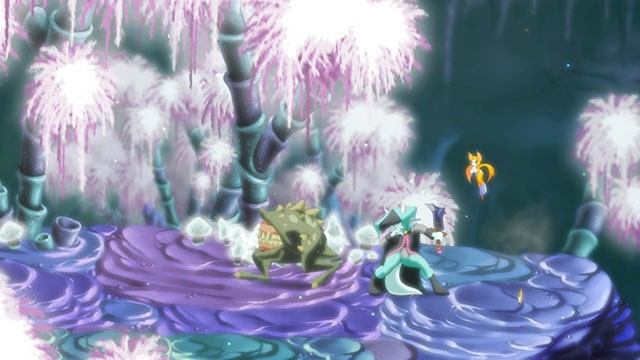 Dust: An Elysian Tail isn’t just the best game in this year’s promotion by a quite considerable margin, but it’s also one of the best games of any Summer of Arcade, and one of the best games on Xbox LIVE Arcade as a whole. If you’ve ever played a videogame in the past and had fun doing it, then you need to stop reading this review right now and buy Dust at the first available opportunity. We’re not even joking. Go. Now. Do it. Assuming everyone took that advice, we should probably start the rest of the review with an explanation as to what a videogame is, since you’ve clearly not played one before. Well, basically, they plug into your moving-picture box and you use a set of hand-buttons to make your little man on the screen move about and do things. That’s about it. There’s probably a better explanation on Wikipedia if you’re still unsure. Assuming you’ve been to Wikipedia, we’ll take it for granted that you now know everything there is to know about videogames, just with some slightly incorrect facts here and there. So, whats this Dust thing all about? Dust is a 2D platforming Metroidvania, crossed with an RPG crossed with a hack-and-slash game, crossed with just everything awesome that’s ever been in a videogame. Taking them in turn; it’s a Metroidvania. The world of Falana is split up into a series of regions, and each of them has its own map, rather than the whole game being part of one map. This isn’t at all restrictive though, and indeed it allows for some wonderful variation in the environments. Sure, you’ve got snow and fire and a forest, but it seems ridiculous to complain that it’s been done before because it’s very rarely been done this beautifully. Each area is vibrant and full of colour (as well as life) and each one is truly a joy to run through – over and over again. You usually won’t be able to find everything in an area the first time you visit, locked doors will block your passage, areas that you can’t reach without a new skill you obtain later in the game will taunt you, and some things will be just be too well hidden, forcing you to come back later. The excellent map screen is great at telling you where youre missing treasures though, so you can just concentrate on collecting them. 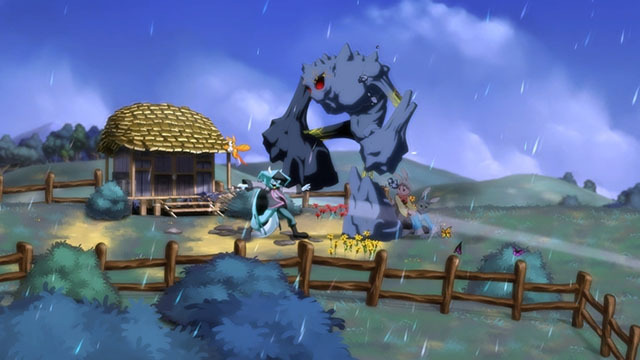 Its RPG elements come from side quests, item crafting and character progression. The titular Dust will be given various tasks as you progress through the game, and completing them earns experience. This experience then translates into level-ups and these translate into skill gems. Gems can be put into HP, attack, defence, or Fidget, and if you still need your stats increasing further then there’s plenty of different armours and trinkets to equip. If you find a blueprint for one, you can craft it yourself with items that drop from monsters, and by the end of the game this leads to numbers flying all over the screen which are satisfyingly massive. Fidget, by the way, is your annoying sidekick – except that in a bizarre twist, she’s not annoying. She has all the hallmarks of a character that should be rage-inducingly irritating: she’s small, always there, and has a high-pitched voice. She’s also completely endearing and has so many funny lines that it’s almost impossible to dislike her if you’re in possession of a heart. She’s even perfectly cast, but then almost everyone in the game is. Voices fit their characters wonderfully, and the fantastic script is brought to life by actors who have been directed properly and clearly know exactly how each line is supposed to sound in game. The quality of voice-acting on offer here is easily on a par with games and films with 100 times the budget. It means that when it’s funny, you’ll laugh, and when the mood changes there’ll be tears in your eyes. It’s actually that good. Fidget’s stat affects the power of her attack, which is part of Dust’s extensive repertoire, and is where all the hacking and slashing comes in. X is your bread and butter slashing attack, which can be combined with Y to perform all manner of combos and various enemy-juggling feats. Holding Y performs the Dust Storm attack, which can be combined with Fidget’s attack (B) for total carnage. Using Dust and Fidget wisely and with skill can result in combos that go up in to the thousands and only stop when you chicken out; a combo is cancelled if you’re struck during it and all the bonus experience you’d have gained is lost. The music is stunning all through Dust but it really stands out when you’re building combos. A note plays as each hit lands and as the combo increases, the pitch of the notes does also. Alongside the gorgeous, fluid animation and the weight you can feel in each strike, the game is basically taking all of your senses at once and making love to them. Its a fairly lengthy experience, too. The game contains a number of secrets to find and wed urge you to make every effort possible to read NOTHING about them at all before you find them in Dust yourself. The size of the smile on your face will be a hundred times bigger, we promise. If you want to discover everything you can expect to be playing for around 15 hours, but it’s difficult to stop there. The combat is so fun, the world so beautiful, with characters so likeable and real, that once you’re playing you just don’t want to stop. 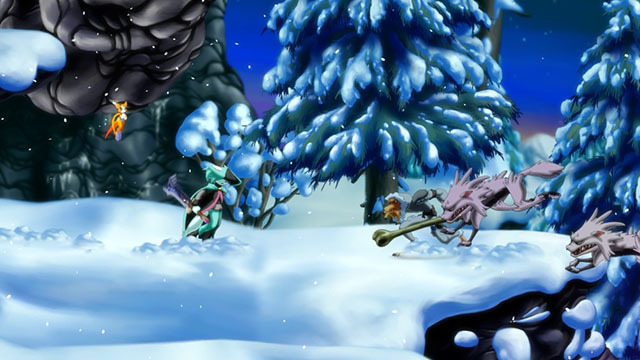 We can’t find a bad word to say about Dust: An Elysian Tail. Usually, even with the best games, there’ll be things you can look at and say “that could have been done differently.” Rarely, and in the case of Dust, you look at it and wouldn’t change a single thing.